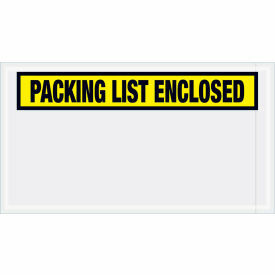 Panel Face Packing List Enclosed Envelopes Protect and Secure Shipping Papers. Packing List Enclosed Envelopes are pressure sensitive waterproof envelopes that stick securely to boxes, tubes and other containers. Back load style keeps documents clean and secure. Envelopes available with either Side or Top openings. Widths range from 4-1/2" to 12". Lengths range from 4-1/2" to 10". Color choices include Blue, Clear, Green, Orange, Red, and Yellow. Sold in package quantities of 500 or 1,000. 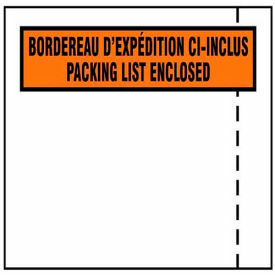 Full Face Packing List Enclosed Envelopes Store and Protect Packing Lists During Shipping. 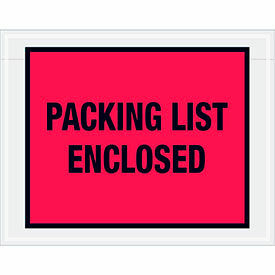 Packing List Envelopes are constructed from heavy 2 Mil polyethylene. These pressure sensitive poly envelopes attach easily and securely to outside of package. Bright colored, full face envelopes ensure documents are always visible during packing and shipping applications. Protects shipping documents from moisture, dirt, and abrasion for added security. Envelopes available with either Side or Top Openings. Widths range from 4-1/2" to 12". Lengths range from 4-1/2" to 10". Available colors are Red, Orange, Yellow, Green, and Blue. Sold in package quantities of 500 or 1,000 envelopes per case.